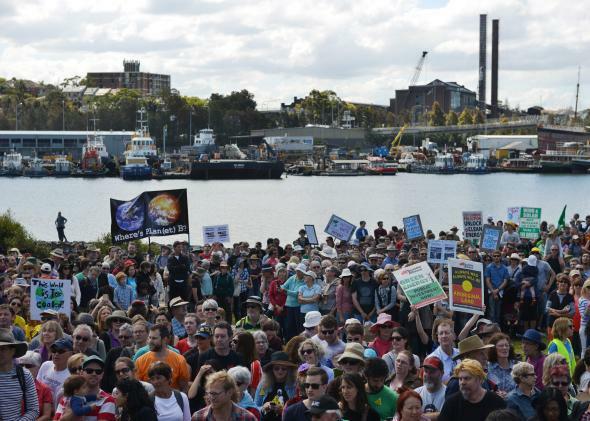 People's Climate March: Protesters sound alarm on climate change. 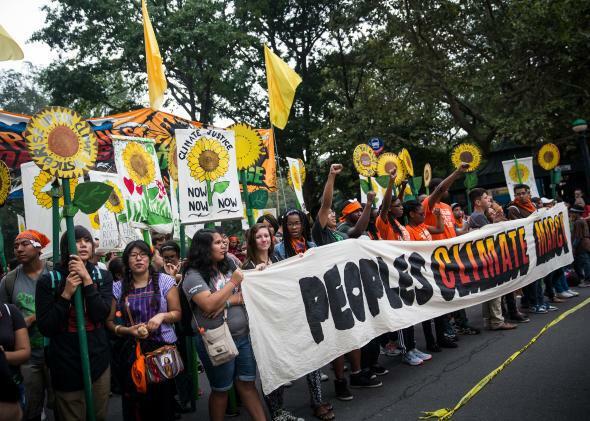 People organize to march in the People’s Climate March in New York City. People are gathering in more than 160 countries on Sunday to demand urgent action on climate change ahead of this week’s U.N. climate summit. The first big march took place in Australia, continuing on in several European cities. In Berlin, for example, protesters organized a silent parade, as organizers said marchers would sync their MP3 players and dance through the city, reports Al Jazeera. The climax of the day is taking place in New York, where organizers expect 100,000 people to show up to the People’s Climate March. U.N. Secretary General Ban Ki-moon is also expected to join what is being described as the largest gathering against climate change in history. Numerous celebrities, including Leonardo DiCaprio, Russell Brand, and Mark Ruffalo have also vowed to show up, as did several politicians, including Senate Majority Leader Harry Reid, reports NBC News. Enviromental protesters gather in a park in Sydney. “You can’t fight climate change sitting on your couch and holding your breath,” said Jamie Henn, spokesman for 350.org, which is one of the organizers of the event. With drums and tubas, banners and floats, the People’s Climate March turned Columbus Circle, where the march began just before 11:30 a.m., into a colorful tableau. The demonstrators represented a broad coalition of ages, races, geographic locales and interests, with union members, religious leaders, scientists, politicians and students joining the procession. 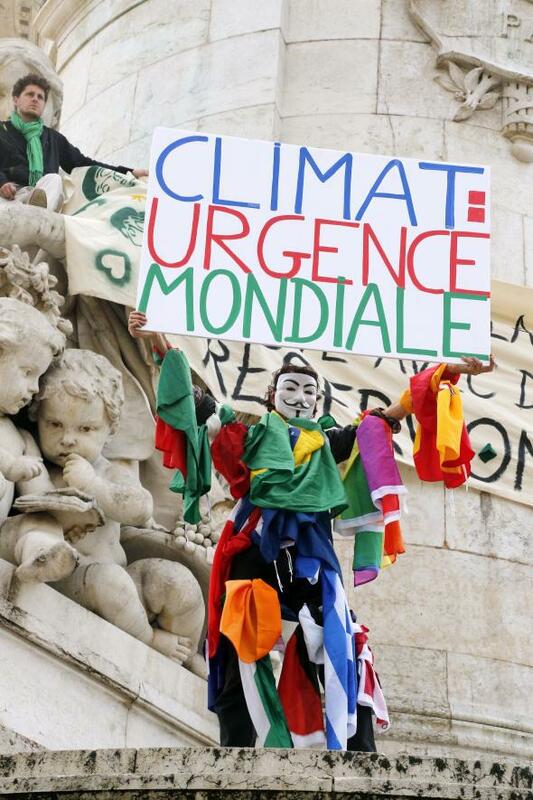 A climate protester wearing a Guy Fawkes mask holds a banner on the Republique’s statue during a demonstration in Paris. New York City Mayor Bill de Blasio got in the spirit of the day and unveiled a plan that will seek to decrease greenhouse gas emissions by 80 percent by 2050, taking 2005 levels as a baseline. All of this action comes ahead of a climate change summit that the United Nations will host a on Tuesday, where leaders are expected to continue negotiations on an agreement to slow down greenhouse gas emissions. A final deal is not expected until late 2015, reports Reuters. 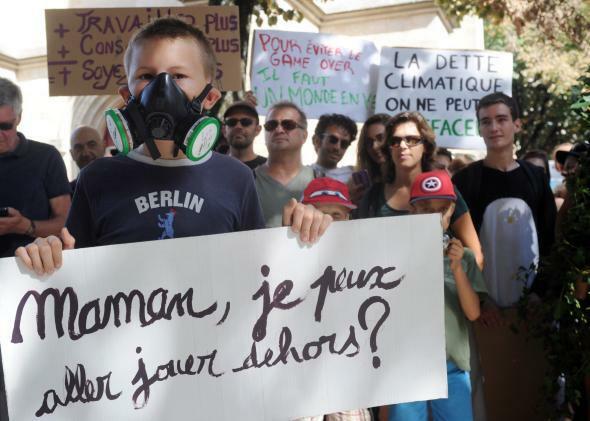 A child holds a banner reading “Mommy, can I go play outside” in Bordeaux.